When a young Chinese princess is sent from her father’s kingdom to marry a king in a faraway land, she brings along the secret most treasured by her people. 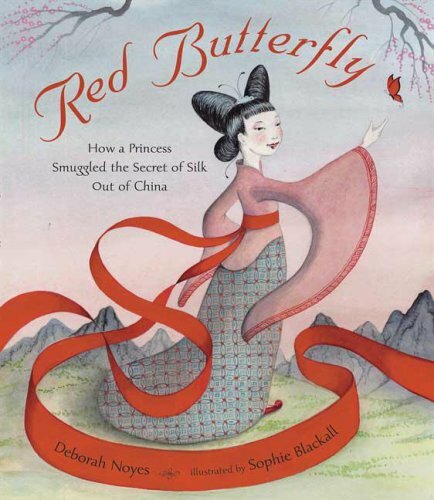 Red Butterfly: How a Princess Smuggled the Secret of Silk Out of China, by Deborah Noyes, brings the story to life with spare free verse, retold in the style of T’ang Dynasty poetry. Most valued of all is silk. 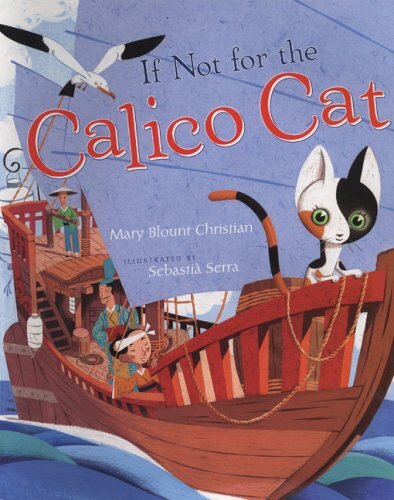 The text is lovely, if perhaps sometimes obscure for younger readers. The illustrations by Sophie Blackall are breathtaking, capturing a traditional Asian style and fusing it with an original interpretation. 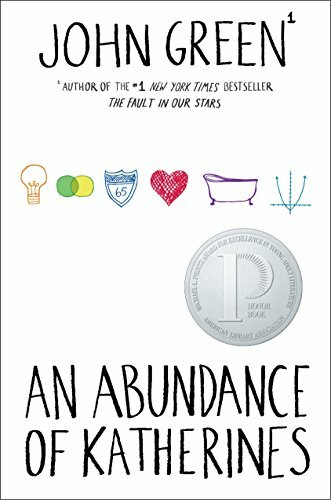 Months ago, the stunning cover of this book caught my eye, and the pages within did not disappoint. Simply a lovely book in art and word. 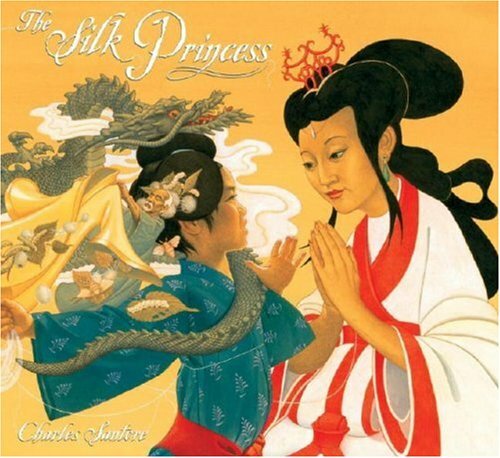 It could be paired with The Silk Princess for a fuller story of one of China’s true gifts to the world. Poetry Friday is hosted by Wild Rose Reader. Head over and see what else is in store for you there. At our screening last night we were able to show “All Roads Lead Away” in high definition  which looked awesome  and get lots of compliments from fellow filmmakers. Unfortunately, we did not take home any additional awards. While I am immensely proud of our film, I’ve learned not to be surprised by the judging. Sometimes a quirkier, but less sophisticated film wins. Sometimes it’s about “wow factor”  like if you have a team filming in Moscow while a crew films in DC. Impressive. Sometimes good acting seems particularly enhanced by the inclusion of many, many f-bombs. Most importantly to us, Bill was excited about how many other directors and teams wanted to talk about our film, our story, and our process. It’s all good. We’ll continue to submit the movie to other competitions and make plans for the next film. I’ll bet that Bill will be putting up the winners with the links later at the Tohubohu blog if you want to see what won. Thanks to everyone for their support. I’ve really blown this whole Asian Pacific Heritage Month thing. I started out well at work at least, updating a bibliography of newer kids’ books and setting up a display to highlight those titles. But on this blog here, bupkus. Not that there wasn’t great inspiration at Fusion Stories from some fellow bloggers. Not that I wasn’t reminded of Fusion Stories from Biblio File. Oh well. I’ll give it the last week of May, starting with a repeat of a post I did in February. In Grace Lin’s book, The Year of the Rat, Pacy is celebrating Chinese New Year with her family and cousins and learning to expect a year of great changes. Unfortunately for Pacy, one of these changes will involve the loss of her best friend when Melody moves away. Pacy is distraught, and sees the new Chinese family that takes over Melody’s house as the enemy. It doesn’t help when the new boy, Dun-Wei, is instantly linked to her at school as the only other Asian kid there. She doesn’t want to like him and resents being thought of as friends just because they are both Chinese. Pacy also finds it hard to fall back into sync with her old friends, now that Melody is gone. How will she make it through this year of changes? 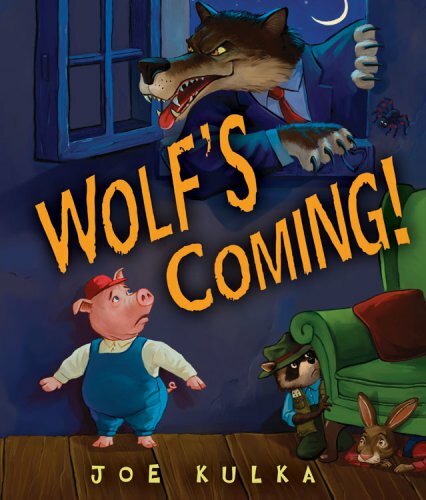 The Year of the Rat is as wonderful as Lin’s first book in this series, The Year of the Dog. 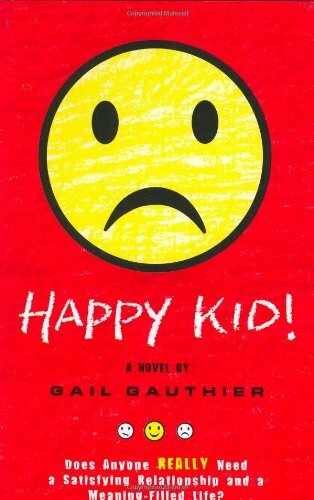 The reader can identify with the childhood crisis of a best friend moving and can root for Pacy and Melody to keep up their friendship long distance. Lin weaves in elements of Taiwanese-American culture, including Pacy’s questions of identity as Chinese, Taiwanese, or American. 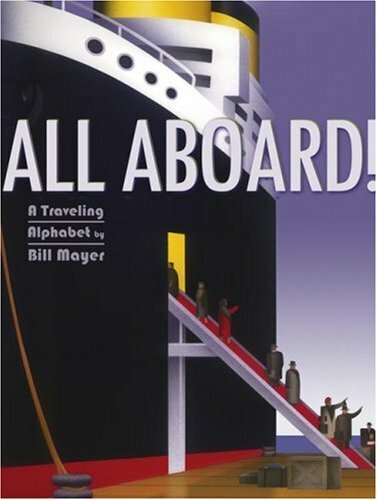 For kids who want to learn more about customs  maybe after coming off a school-sponsored, Chinese New Year extravaganza  this book will take them far while being a pleasant journey all the way. The Best of the 48 Hour Film Project has been announced, and our movie, “All Roads Lead Away,” is among the finalists. We’ve known for a few days because they wanted to get the films in high definition (assuming they were shot that way). That means that we know  shhhh!  that we were actually among the top fourteen films selected. Our movie will screen in the second group at the AFI Silver Theatre in Silver Spring. Tickets are available now, and will sell out. But if you’re nowhere near the DC area and are curious about the films in competition, Bill has found the films that are now viewable online. Watching even a few offers a real education about how hard it is to write, film, edit, and score a movie in two days. Check the list of finalists  with links to the films  at the Tohubohu Productions news blog. And if you haven’t watched “All Roads Lead Away” yet, written by Young Adult author Barry Lyga, well what are you waiting for? Go. May is my personal perfect storm, when all areas of my life need my complete attention. My obligations to kids, work, and home all collide with the force of a... well, something big. I find myself clinging to an internal checklist of events. 48 Hour Film Project? Check. Drama Club play? Check. Girl Scouts Awards ceremony? Check. Sixth grader’s birthday? Almost check. Presents though, check. She’s getting some good stuff. Something electronic. A little Abercrombie  even though their email promotions creep me out. So much skin for a company selling clothes. A little jewelry  because what tween doesn’t need more earrings? And she’s getting a book she personally requested after reading the library copy. A book that she finished and immediately said, “We have got to buy this!” That book is The True Meaning of Smekday, by Adam Rex. 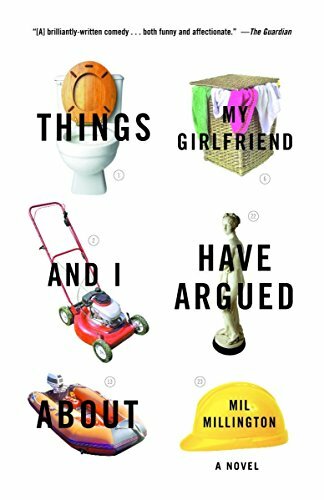 I promise that soon we’ll be back with a co-review  or even a tri-review with my husband, who also loved the book. 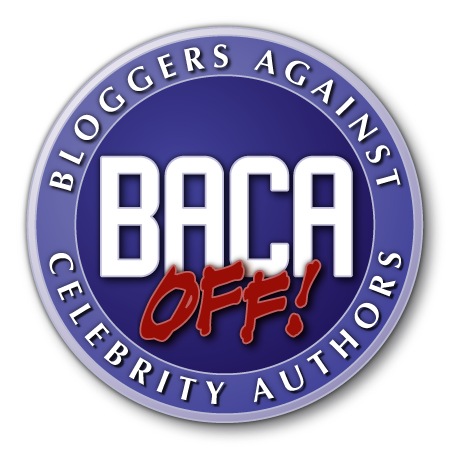 For today, you can read his interview over at Fuse#8 as part of the Summer Blog Blast Tour, where dozens of authors visit blogs to talk about books. Now as with most events, the ones who crash the party are like, totally the coolest. C’mon, we’ve all seen Wedding Crashers. So tomorrow you can check out my interview with Kelly Bingham, author of Shark Girl. Totally off the schedule, totally off the hook. 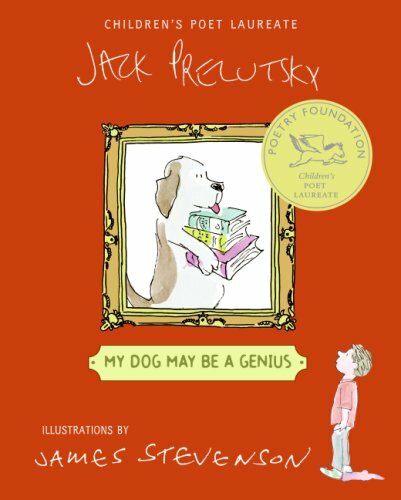 Jack Prelutsky is really milking this Children’s Poet Laureate thing for all it’s worth, don’t ya think? His new collection of poems, My Dog May Be a Genius has his new title and signature above the title. In fact the title looks like an afterthought. There’s also a big gold sticker from the Poetry Foundation on the book. Unfortunately, I wasn’t crazy about the book. I’m not a big fan of nonsense poetry. I like the Shel Silverstein books as an exception, but I didn’t like his oldest (but now newest) book, Don’t Bump the Glump! for the same reason. It’s just wacky. There’s an improv concept that everyone wants the sketch of the chicken in the bowling alley, but it’s actually harder to come up with something clever for the man in the office. The crazy jutxaposition of the elements is the joke, rather than the artist  improv or poet  adding insight and humor to the situation. So is the poem then funny or clever on its own merit, or is it more about thinking of the original oddity? 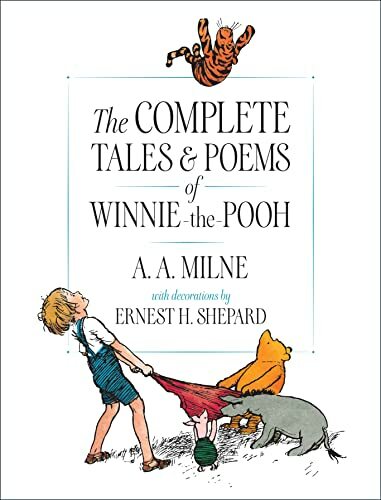 In this book, there aren’t enough of the more “normal” poems in the collection to keep it from going over the top. And when there is a nice, almost moving poem about having a place to go to inside yourself, it’s followed by “Burt the Burper,” which ruins the mood. But that’s probably the point. The only poem I really liked is the title poem. It’s more about an everyday thing. It also hits on an personal note, since I can’t understand anything that people spell. and in fact, there’s little doubt. 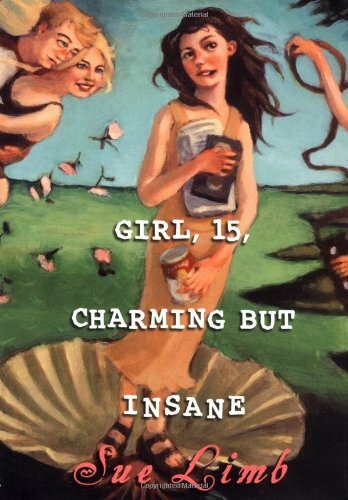 I know lots of people will like this book for its absurdity, and that’s okay. 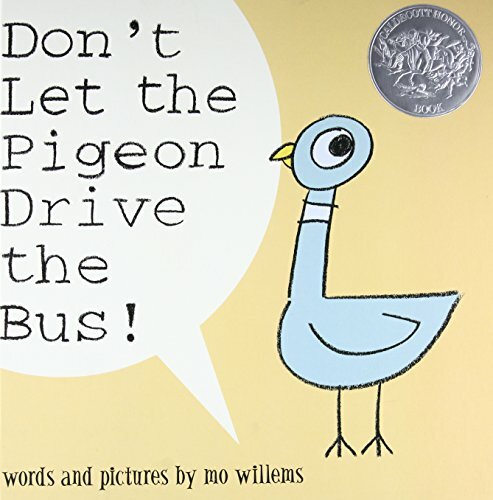 I just wish Prelutsky had taken the opportunity of his title and his talent to mix in a few more subtle poems and introduce children to a greater range of expression. The Poetry Friday round-up is over at Two Writing Teachers. Worldwide, things have pretty much sucked lately. The cyclone and flooding in Burma. The devastating earthquake in China. The fierce tornados in the United States. The food crisis in many, many countries around the world. It’s overwhelming in its tragedy. Then there are the racist incidents that Obama backers have faced on the campaign trail. The horrible treatment of immigrants in detention. And  let’s say it  gas prices. I don’t even care what the article says  I could die happy with that phrase alone. 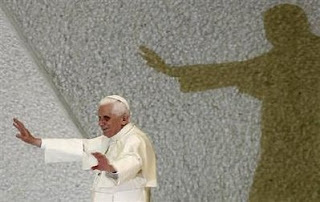 But then add the picture, which looks oddly like the pope is holding off an invading horde of little green men. The ominous shadow was actually cropped out at Yahoo. Can’t imagine why. And there’s still more! At the end of the feature, the little magnifying glass symbol to indicate searches implores us to “Find the Vatican’s new sins list.” Is this the Where’s Waldo for Catholics? Hey, I think I see genetic modification! What’s lightening your heart these days? I was tagged for a meme by Read, Read, Read, and the timing is perfect for me. I usually get tagged and then totally forget to do it until it feels more embarrassing to admit my procrastination than to totally ignore the tag. But today, I’m recovering from the two days of heavy rain, which has left me feeling all depressed and uninspired to write. But answer questions? I think I can handle that. When I first saw this meme, or some variation thereof, all the answers were in fives. So I went back to that format. I was working at the public library, settling into my new house, raising two kids, and stepping a toe into the short film business. Speaking of which, please go see our new film, “All Roads Lead Away,” written by young adult author Barry Lyga. Did I mention that I filmed the first part on my own? Bill said it wouldn’t work, but I insisted that it wouldn’t take extra time and we might end up with some good footage to use. And so we did. Clean the hamster cage  with the hamster’s nine-year-old owner. Sort out the Girl Scout badges for our upcoming ceremony. Buy cups, plates, and flowers for the Drama Club play tonight. Graham crackers with peanut butter and honey. Yum. Donate money to various places. Buy new houses for me, my mom, and my brother so we could live closer together. Hire an organizer to clean up my cluttered house (life?). Put money in a trust for my children, because you never know what will happen to today’s billions. Getting cranky  like a small child. Waitress (for one unfortunate month). I’m tagging some bloggers that I don’t visit enough, but that came up on my Technorati links recently. Let’s get to know each other  what do you say? Since I’ve got editorial privileges over here, I thought I’d stick in a little notice to let readers know that the latest short from Tohubohu Productions, “All Roads Lead Away,” is now available for viewing over at our official website. Written by Barry Lyga, directed by yours truly and produced by MotherReader herself, the film is a great little road movie about a couple struggling to move on with their lives after losing everything. So sit back, grab a tub of popcorn (or maybe just a bag  it’s not all that long a film), and give it a viewing. And if you like it, don’t forget to let us know (and spread the word)! I’m physically sick about this. (Yes, Kelly, my stomach lurched and hasn’t stopped yet.) I’ve set out my hamster traps. I’ve prayed to Saint Anthony (“Saint Anthony, Saint Anthony, please come around. Something is lost that needs to be found.”) and I’m not even Catholic. I’m planning on staying up tonight when these little guys are active to see if I can catch her then. In the meantime, I’m fighting my anxiety and sicky stomach and cleaning up every place I can to search for a little sleeping Honey hamster. The problem is that the place is a mess, and therefore there are tons of places a little hamster could hide, and that fact is just making me feel sicker and more anxious. Please send me your good hamster-finding energy. And if you have any good tricks, pass them along. 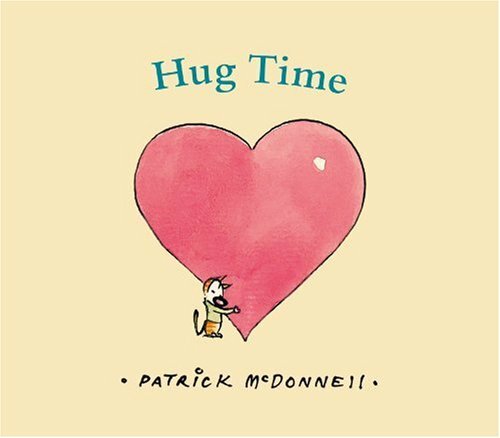 A kitten wants to hug the whole word, so he travels around the world to hug everybody. He does a pretty good job of it, too. But then he sails home to hug his person. Cute enough, but not as well done as some of the McDonnell’s other titles. This ending quote made me feel kinda warm and fuzzy inside: “The world’s so big, and yet so small, it’s time that we embrace it all. That’s something that we all can do, start with the one who’s closest to you.” Awwwww. 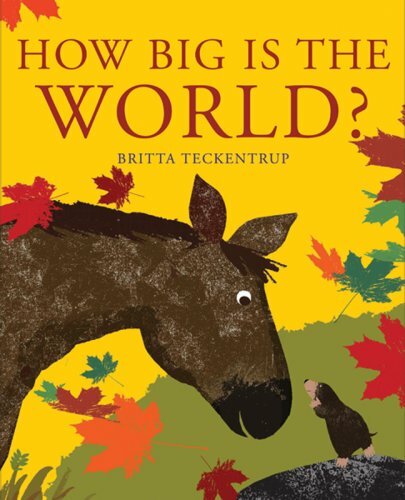 Little Mole asks his papa “How big is the world?” His papa suggests he go find out, so he heads out to ask other animals. Each animal names a bigger and bigger world (the spider’s world is her web, the mouse’s world is the field, etc.) But by riding on the back of the whale, the mole sees how big the world really is and how it never ends. When he misses his family, they head home and papa is waiting for him. “How big is the world?” whispers papa. “As big as you want it to be,” says Little Mole quietly. 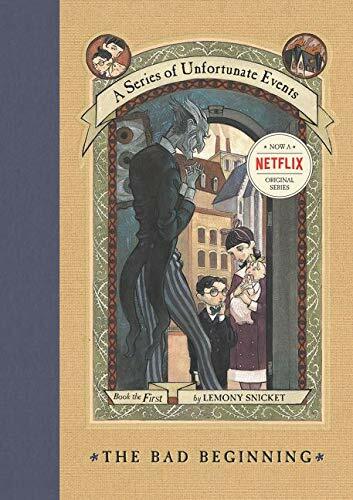 Other than the serious disconnect between exploring the entire world and getting home by bedtime, I liked the book a lot. 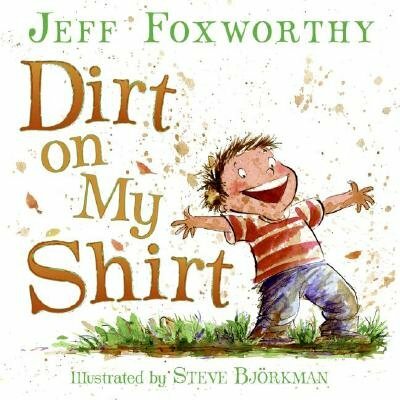 The illustrations are engaging, and the story is a great introduction to variety in the world around us conveyed with a sense of awe and wonder. 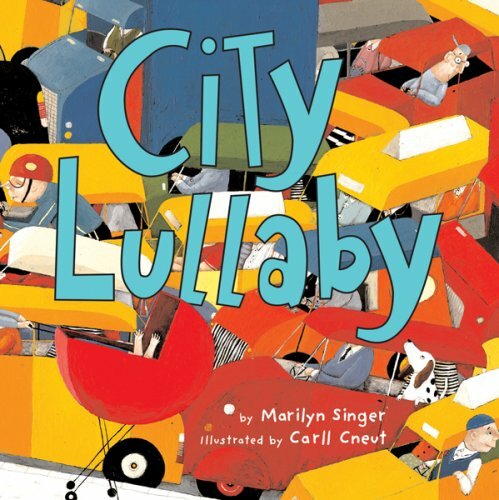 A counting book set in the city, where a baby sleeps through all the noise and busyness around her/him. 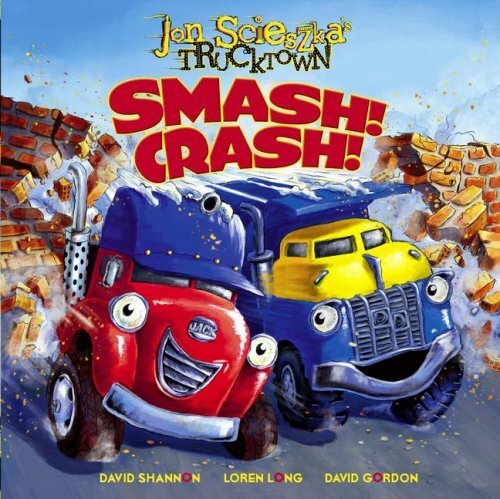 Bright and detailed pictures make this a fun counting book with city themes — dump trucks, taxi horns, and such. The art is on one side of the page, all lively and sometimes silly (notice the dog on the cell phone for nine annoying cell phones ringing.) On the other page, the text and a simple sketch of the baby’s sleeping face (line eyes with lashes, curved lines for nose and mouth, dots for freckles, and sometimes a curl). 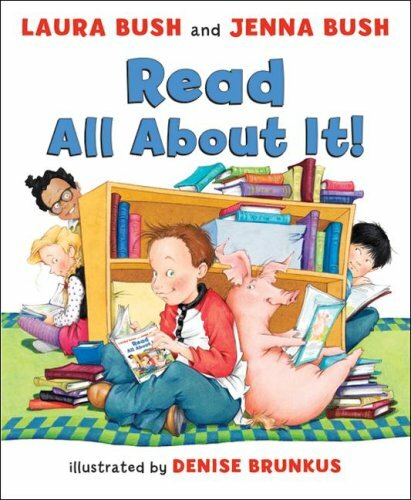 A fun title that would be especially perfect for city kids. I’m still tired from the 48 Hour Film Project, and I wasn’t even that involved in yesterday’s work. The experience of making a film in two days is so intense that it takes a lot out of you. Our script by Barry Lyga was ambitious, and our filming went from our Saturday 8:30 a.m. call time until almost midnight. It was a very long day for the crew and our two lead actors, who really carried the piece. Well, three lead actors if you include the beat-up car which we considered the third star of the movie. Barry gave us an amazing script, dramatic and contemplative. Bill and I selected two strong actors (Jennifer Massey and Joe Hansard) who could pull off the emotion of the film. We got to test the new camera car mount, to the delight of the cameraman. I kept asking for reassurance that the expensive camera was not, was NOT, going to fall off the hood of the car. After a last-minute location change, I was slotted for a small part in the movie  which ended up on the cutting room floor in the interest of meeting our seven-minute running time requirement. I’m still in the background helping a customer, and my hair is in a later office scene. Oh, the glamour. Bill spent Sunday editing the film at his workplace, while I searched for music at home. I found the piece that we ended up using within a few minutes. Unfortunately, I then spent almost two hours continuing to search for music, finding almost nothing, and deciding to stick with my first choice. After Bill was forced to make some difficult decisions about editing, he sent me the film online so I could look at it. With my fresh perspective  having not spent the last six hours putting it together  I was able to suggest different places to cut, allowing some great moments to fit back in (though not my scene, alas). For later festivals, we may look at putting in a lost scene where the couple fights outside the car. It was a crew favorite as Jennifer screamed, “GET IN THE CAR!! !” with pure fury. Our screening is Friday at 9:30 at the AFI Silver Theatre in Bethesda, Maryland. We’re really proud of it, and I can’t wait to see it on the big screen. If you’re in the area, you can order tickets online  but do so soon, because the shows always sell out. If you can’t get to the show, the film  “All Roads Lead Away”  will be available on our website sometime after the screening. Incidentally, now you can see the trailer for Bill’s production of “Number One With a Bullet,” a short film about getting your book published  at whatever the cost. Seems like that film may be of some interest to the MotherReader crowd, don’tcha think? I haven’t played in my StatCounter keyword analysis for a while, but it’s always so much fun. I found an older poem that I put together with some favorite searches in the Diamond form. I was originally inspired by the form of a OULIPO, a poetry challenge at Miss Rumphius. I think the searches are so funny, and yet so telling at the same time. That’s why I love ’em. The first one is from a while ago, the second one I created today. My favorite searches are “Mo definitely” and “Condescending forgotten poem.” I can’t even imagine what that second one means, but the Mo definitely is right on target. Check out the Poetry Friday round-up at Big A, little a. Thank you to everyone who made RIF’s FY09 Dear Colleague Campaign a success! RIF’s 5th annual Dear Colleague campaign was a success thanks to the overwhelming number of supporters who asked their members of Congress to sign the letter to appropriators to save RIF’s funding. The combination of more than 45,000 e-mails, phone calls, letters, and faxes from supporters across the nation bolstered our effort to highlight RIF’s services and accomplishments throughout this year’s campaign. A notable achievement of this year’s campaign is the increase in the number of members of Congress who signed RIF’s funding letter. This year’s impressive increase can be attributed to all who gave their time to contact their members of Congress and voice their support for RIF. This ensured that members of Congress became educated about the important work RIF does in their districts and states and made a compelling argument for saving RIF’s funding. Whether your legislator is a new supporter or a continuing supporter, it is important to let them know that their work is appreciated. Please see if your member of Congress is on the co-signer list and take a moment to send a personalized thank you note. Send your thank you letters to RIF’s Government Relations team, and they will hand deliver them to Congress to ensure the letters are received in a timely manner. Thank you for your continued support, and please visit RIF online to participate in our May children’s letter drive to Congress with easy to use instructions and templates. Virginia’s senators signed  Wahoo!  how about yours? 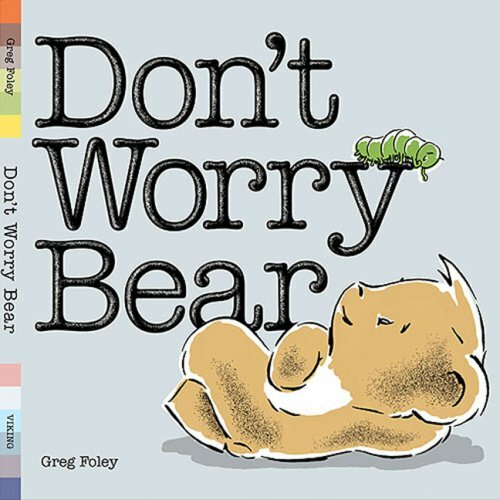 This is the second book following the less-than-originally-named Bear, and like the first book, Thank You Bear, is a simple book in words and illustration. When Caterpillar makes a cocoon, Bear worries about him. Caterpillar reassures Bear that he isn’t bothered by the wind or rain or snow. Snow? Well, whatever. In the end, Bear finds the empty cocoon and worries a lot, but finds that Caterpillar has turned into a silk moth. I have to wonder why Caterpillar didn’t just explain the situation to Bear. It seems like it would have helped Bear not worry so much. 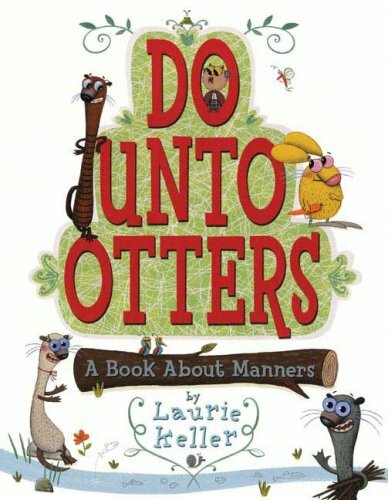 No matter; cute book and — hello! — cute author/illustrator. 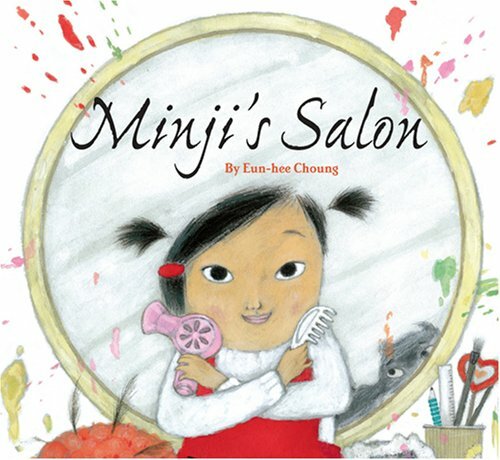 This is one of the few picture books I’ve seen with the author’s picture in the back — and one of still fewer where said photo’s inclusion was such a bonus. 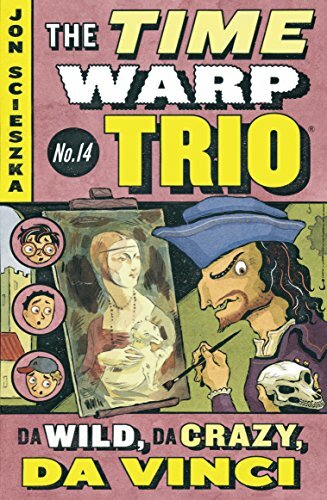 Where’s Fuse#8’s Hot Men of Children’s Literature when you need it? Alert: WAPB illustration contender. Bear paints a picture and is enjoying himself, just as two proper gentlemen come by and try to ruin it for him. 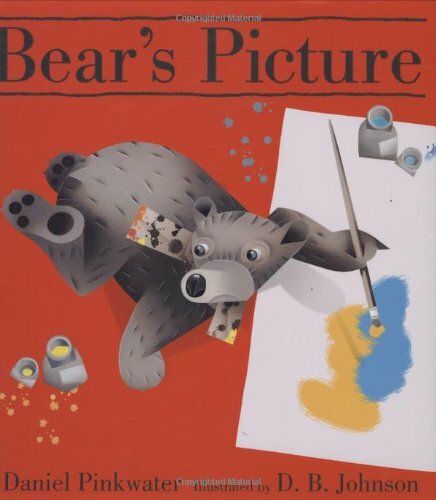 They insist that bears can’t paint pictures — and besides, nobody can tell what the picture is supposed to be. But bear can tell, and he is happy with himself and his art. This is like a self-help book in picture book form. There’s even a possible psychological element when you see the two men step into the colorful picture and get... well, drowned in the stream. Could the two men represent the our own inner critics? Read the book and you be the judge. Interesting book with an odd note to it. 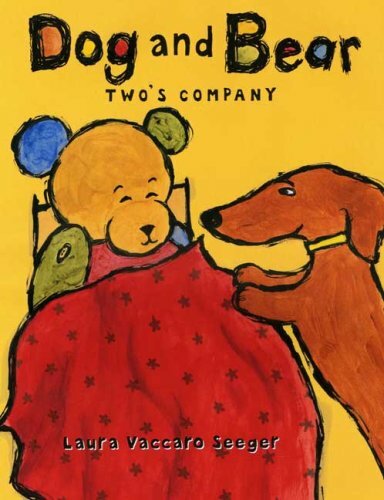 I loved the first Dog and Bear book. A toy bear and a wiener dog has got to be the best pairing since Sonny and Cher (Justin and Britney? Mary Kate and Ashley?). 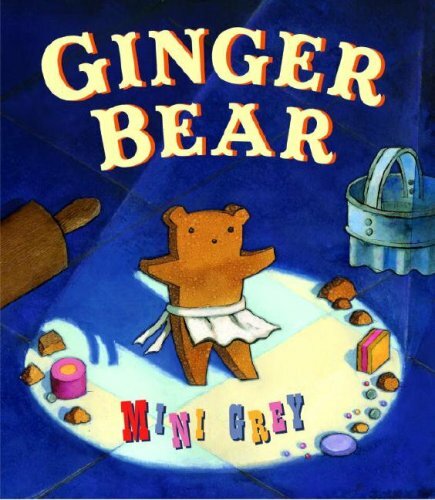 This book contains three mini-stories of Dog and Bear’s days together. In one tale, Dog is mad and going to run away. Oh, but is that ice cream? In the next story it’s Bear’s birthday, and Dog can’t quite resist the cake he baked. In the third story, Bear helps Dog gets to sleep and gets worn out himself. 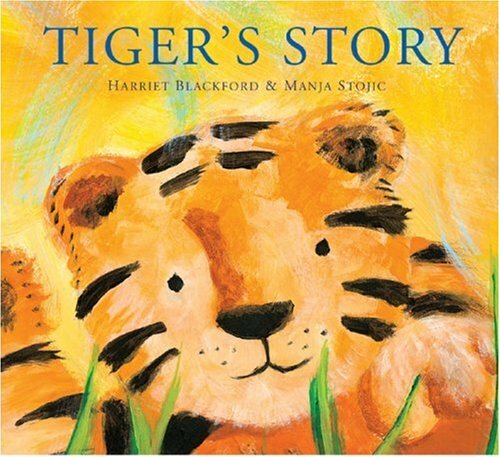 They are all cute stories, and will be enjoyed with or without knowing the first book. Keep ’em coming, Seeger.